This recipe is everything I’m into right now. It’s quick, flavourful, and nutritious. It’s brimming with good stuff like vegetables, fibre, protein, and healthy fats, but requires minimal effort to prepare. Starting now and continuing through to March, I’m going to be resisting the urge to start every blog post I write with whining and moaning about the seemingly never-ending season that is winter. So let’s just lay it on the table right now. Winter has me feeling totally burnt out. Why is it that humans don’t hibernate again? Right now I want to sleep through ’til spring. During times like this, fueling our bodies with healthy food is super important! Unfortunately, this is often when I’m least enthusiastic about cooking healthy food. 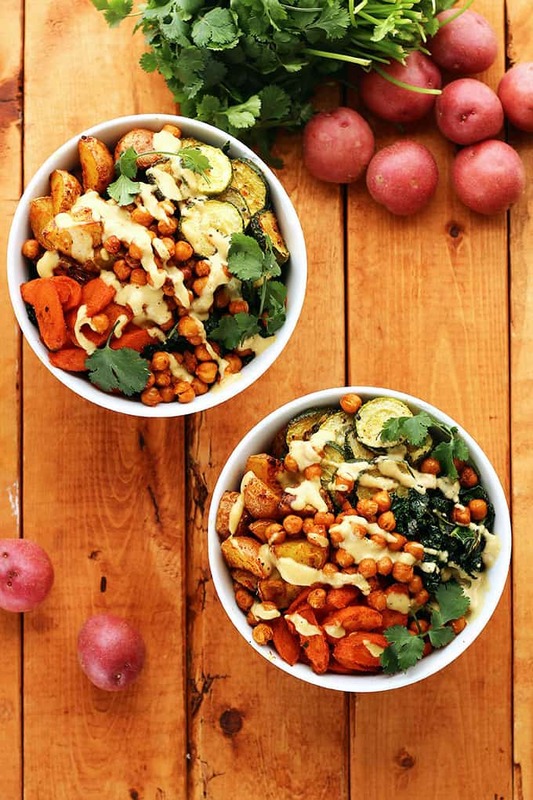 Spicy roasted potatoes, crispy-crunchy chickpeas, spiced slightly sweet carrots, zucchini medallions, garlicky sautéed kale, and a creamy hummus dressing. Serves 2. Spicy Potatoes & Chickpeas: Preheat oven to 425F. Combine all ingredients in a medium bowl and mix well. Transfer to a sheet pan lined with parchment paper. Roasted Carrots: In the same bowl used above, combine the carrots, olive oil, garlic powder, turmeric, paprika, maple syrup, and salt. Mix well and transfer to the sheet pan from the previous step. Zucchini: Using the same bowl, combine the zucchini, olive oil, and a sprinkle of salt and pepper, mix well. Transfer to the sheet pan. Roasting:Bake everything for 15 minutes. Flip/stir everything and bake for another 15-20 minutes, until potatoes are tender and chickpeas are crisp. Preheat olive oil in a large skillet over medium-high heat. Add the minced garlic and kale. Sauté, stirring often, until kale wilts. Sprinkle kale with 1 tsp lemon juice, and a pinch of salt and pepper. Continue sautéing until kale is tender. Taste and adjust seasoning if necessary. Combine all ingredients (in a blender or using a whisk.) Thin with water if necessary. Taste and adjust seasoning. 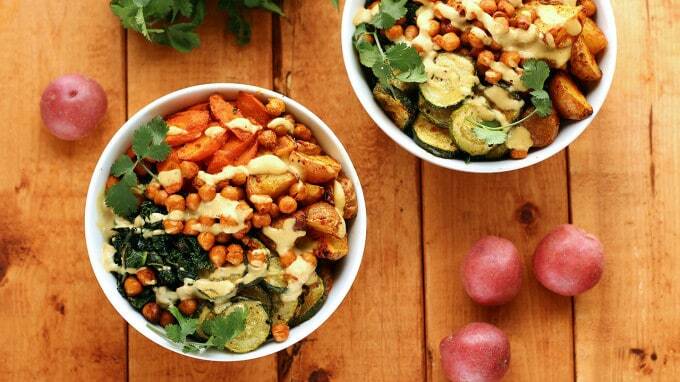 Divide kale between 2 bowls. 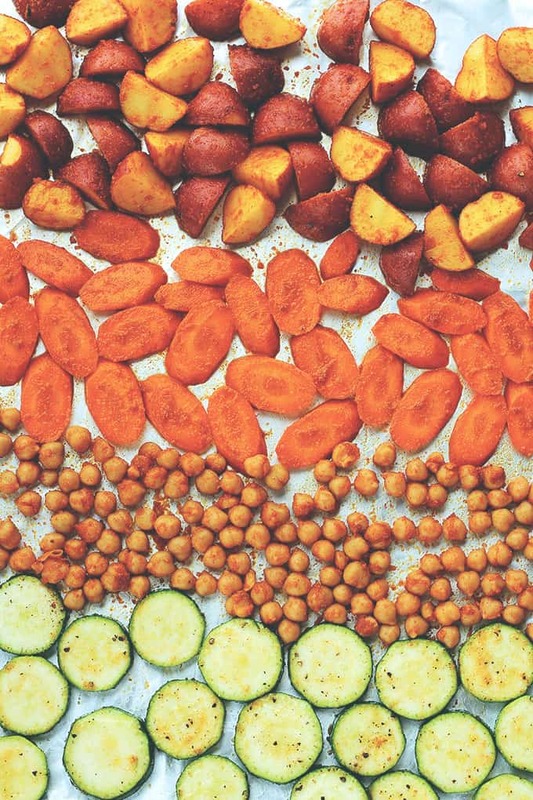 Top each bowl with 1/2 of the roasted potatoes, 1/2 of the carrots, and 1/2 of the zucchini. Top with 1/2 of the chickpeas and a drizzle of hummus dressing. Power bowls are my thing these days…I figure when all else fails, assort your fave veggies, a grain and a lean protein and you’re good to go! And of course, a potato or two usually makes its way into the mix for me too 🙂 Looks delicious! Thanks Janet!! The hummus dressing would be great on all sorts of things, sandwiches, wraps, salads, anything! This looks so delicious! Flavourful and plenty filling 🙂 perfect for a lunch to keep you energized all day! Thank you so much Mel! I agree! I love everything about this. It looks totally delicious and is stuffed full of my favourite things! I made this last night and it was very good! Love the combination of veggies and flavor. 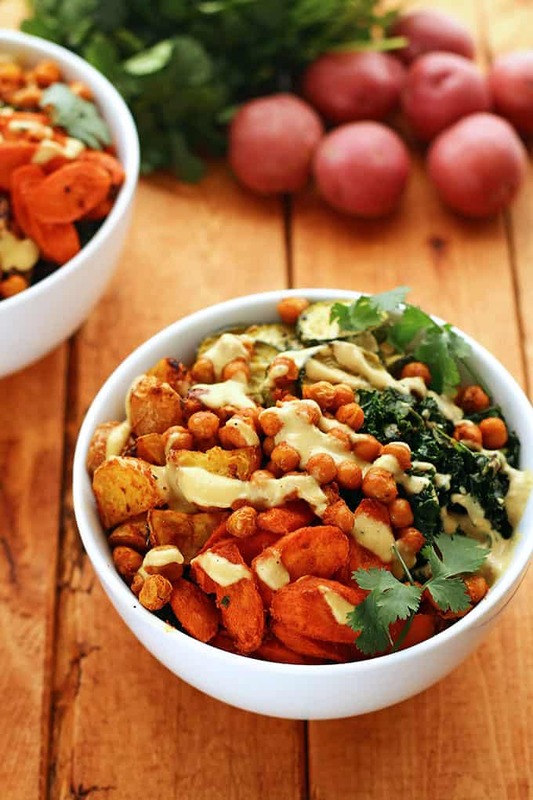 Gosh I love food that’s in a bowl – especially when it looks that good! Do you think any kind of red potato will work well? I live in the UK and my local supermarket basically has new potatoes, russet red potatoes, or “baking” potatoes! Hi Luci! If you can’t find “Creamer potatoes”, new potatoes or “baby” potatoes will be your best best! That’s a good question!! Why don’t humans hibernate? This is such a great dish! I’ve made it several times, I had to sub some things, and used red & yellow bell peps with the carrots and omg yum. 🙂 Great textures and layers of flavor. Love your site, thank you so much! Thank you so much Jen! Your substitutions sound delicious! Just found your site. Newly vegan (week long) and I was wondering if you may know of any sort of vegan nutrition tracker to make sure I am getting my daily intake of protein, calcium, iron, etc. My best friend and I made this last night, after eating junk food all weekend. We both have access needs that make us suffer from tiredness among other things. We made this, and it was DELICIOUS! We doubled the recipe for leftovers, and we loved it so much. We swapped the zucchini/courgette for sweet potato, and added it to the potato/chickpea mixture. The mixture of flavours and the hummus dressing are divine. I recommend to anyone! If I don’t have hummus, is there something else I can use to make the dressing? Thanks! This was delicious! I made this last night for dinner for me and my non-vegan husband. He really enjoyed it too, so that’s a big win! (He’s super picky). I may make it again, but it was a lot of work because I didn’t have hummus or tahini and had to make them both first. I used these really cool multi-colored potatoes from a local farmer’s market here in Tokyo. It was beautiful! Oh yes I can see how that would be a lot of work if you need to make hummus and tahini first. I think you could freeze both for another time! Thanks for commenting Melissa!